A new study takes a close look at how Tyrannosaurus Rex’s arms would have functioned, a question that has been hotly debated for years. By studying the limbs of two distant modern relatives of the extinct theropod, the researchers found that its tiny limbs were far more flexible than previously believed. The research was presented at a recent meeting of the Society of Vertebrate Paleontology. 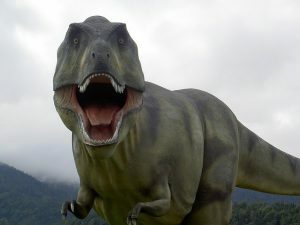 T-Rex roamed the Earth between 65 million and 80 million years ago. It’s tiny limbs with sharp claws has baffled scientists pondering their function and usefulness. Some believed that their arms didn’t do much of anything. The new research disputes this. This latest study researched the range of movement to determine the usefulness of the arms. For comparison, the researchers studied the limbs of the American alligator and the domestic turkey. The study suggested that complex elbow joints allowed for a range of motion far greater than a mammal could achieve. The scientists used a technique called X-ray Reconstruction of Moving Morphology (XROMM) to examine the ulna and humerus of the modern animals. This allowed them to analyze the movements made possible by soft tissues, which are often lost in the fossilization process. The researchers said that it was surprising to see how much the forearm bones could rock side to side at the elbow. That is not a range of movement generally seen in mammals. This expanded movement at the elbow would allow alligators and turkeys to turn the palm of the hand inward and upward like we do. The team concluded the T-Rex most likely used its arms to hold prey in place or pull it closer. Its arms could have been used to keep prey at the perfect biting distance for its powerful jaws.